REDUCED PRICE!!!! Great buy at this price point. This beautiful 2 bedroom 2 bath condo is a true "10". Seller says sell it. Remodeled 4 years ago and shows like brand new. It has 1,378 sq ft and has many custom features that appeal to the fussiest of buyers. A nice open floor plan. Arched openings to the hall and kitchen. Crown moldings thoughout. Hardwood floors thoughout. The kitchen has recessed lights, lots of custom cabinets with Italian Marble countertops, upgraded Kitchenaid appliances including double oven with microwave and convection, Bosch dishwasher, Self closing drawers and doors, Wine rack and double trash cabinet and an arched passthrough. The living room has a gas fireplace with electric switch, Oak mantle and Italian marble surround. 2 Panel arched doors with satin silver lever handles throughout. Dual pane windows with custom window treatments throughout. Custom fans with lights in Den and both bedrooms. Guest bathroom has tub/shower combo, both bathrooms have custom cabinets, custom sinks with satin silver faucets, Beautiful tile on floors and in showers, Custom glass doors, Toto toilets with heated seats and bidets, Heavy duty fans. Both bedrooms are good size with walk in closets and custom closet organizers. Patio with lots of plants. Community heated pool, spa and sauna. 1 assigned parking space in gated garage with extra storage. 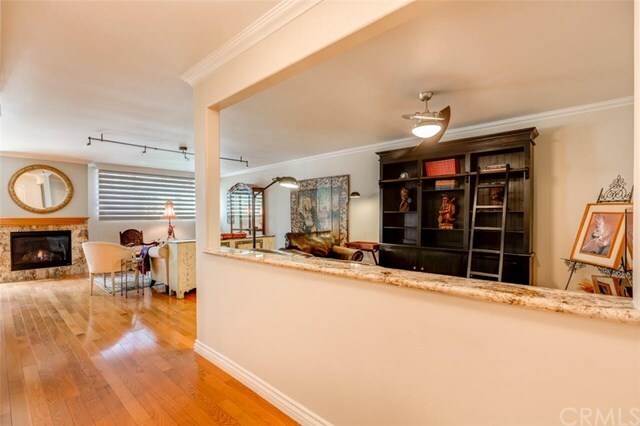 Walking distance to Barrington Rec Park, Brentwood Village and restaurants on San Vincente. Close to frwy access. Selling Office: So Cal Life Realtors Inc.